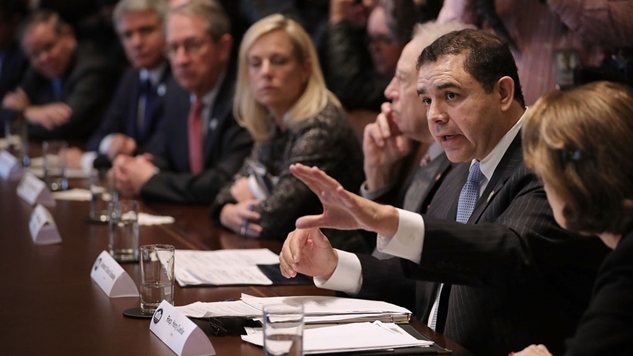 PLAYBOOK EXCLUSIVE — WITH CONTROL OF THE HOUSE IN PLAY … DEMOCRATIC TEXAS REP. HENRY CUELLAR invited supporters to a breakfast fundraiser for REPUBLICAN TEXAS REP. JOHN CARTER this morning in San Antonio at Mi Tierra Cafe. The invite sent from a Cuellar political staffer links to a “John Carter Conservative for Congress” contribution page with donor levels up to $2,700. Republican John Carter’s Democratic opponent, MJ Hegar, rose to fame with one of the greatest political ads you will ever see, but apparently she isn’t “Democratic” enough for Henry Cuellar—the co-chair of the Blue Dog Coalition. Although I was not a host of the event, I was honored to attend as I typically do for colleagues who visit my district. Judge Carter is a dear friend and trusted colleague with whom I work on Appropriations. He is knowledgeable and supportive of issues important to South Texas. In today’s climate, more than ever, friendship is more powerful than partisanship. Translation: I don’t care about the Democratic Party or liberal policies one bit and am trying to play both sides in order to preserve my House seat as long as possible (Dear liberals, please primary this jerk into oblivion the next chance we get). This is an instructive moment to the fight on the left. I understand longtime Democrats being upset over Bernie Sanders’ popularity with Democratic voters given that he does not support the Democratic establishment, but when the Democratic establishment is populated with “Democrats” like Cuellar who openly support Republicans, what the hell does “supporting the Democratic Party” really mean? It should mean supporting liberal policies. Endorsing Republicans in a winnable Republican-leaning seat is not that. This is an object lesson in why liberals like me who supported Hillary over Bernie have gravitated towards the anti-establishment platform of “Bernie Bros.” Shutting up and falling in line with the Democratic establishment all too often results in supporting Republican policies. This doesn’t stop at the House appropriations committee—it goes all the way to the top of the government—as Democratic leader Chuck Schumer, who is historically bad at his job, has undeniably been one of Trump’s biggest allies in congress. The Democratic leader in the Senate needs just one vote to throw a wrench into Trump’s goal to remake our judiciary in his image, but instead, he’s standing by, twiddling his thumbs while his party confirms confirmed torturers to run the CIA and deregulates the banks (again). Chuck Schumer is not a Democrat! Mark Warner is not a Democrat! Henry Cuellar is not a Democrat! Anyone supporting Republican policies is not a Democrat!!! It’s crazy that I even need to say (scream) that last one, but again, this is the party who lost to Donald Trump. Illogic is the status quo at the top of the Democratic Party, and that’s why people like me support “non-Democrat” Bernie Sanders’ aim to destabilize the bipartisan political order in our nation’s capital. Liberal parties should be liberal. The Democrats haven’t been, and it’s because many of those in leadership don’t use their power to support liberalism, and instead endorse Republican politics, like “Democratic” congressman Henry Cuellar.